You’ve heard that expression haven’t you? Well, probably not, since the actual expression is “A journey of a thousand miles begins with a single step,” attributed to Confucius. But this journey, the 10,000 steps one, is about lifetime fitness. I’ve been working on writing information for my diabetic patients on eating and exercise, and ran across some literature that advocates taking 10,000 steps (about 5 miles) a day. I’ve read some different variations of this, and if you want to know the basics you can read here, or do a search on your own. The basic premise is that walking 10,000 steps per day (the rough equivalent of 5 miles for a person with an average stride) is thought to be a reasonable amount of exercise to maintain fitness and weight, and is something that an average healthy person should do just about every day. The suggestion is that one should take a brisk 30-60 minute walk for the first 5,000 steps, aka 2.5 miles, then accomplish the rest by one’s regular activity. If your regular day is sedentary, you’ll have to do more in the planned walking part to make up for it. In researching this, I began to wonder if the average person has enough activity in a typical day to rack up 5,000 or so steps a day. I found a pedometer lying around the house that counts steps, and tried it out. Since my exercise is biking instead of walking, which my pedometer cannot record, my goal is to see if I can get around 5,000 steps during my typical day. Then if I add on the calorie value of biking (100 calories = one mile) that should be the equivalent of walking another 5,000, to bring the total for the day to 10,000 steps. I’d probably have to bike 45 minutes to get the additional exercise I need. I do more some days, less some days, so let’s hope it all evens out. Day 2: I was at the clinic all day. I do a fair amount of walking around there but it’s a small building. Probably at least one-quarter to one-third of my day is standing or sitting. Today I went out at lunch time, so that added some walking to the car, the restaurant, and back again. At home I did my usual evening activities, went to the gym to lift weights. 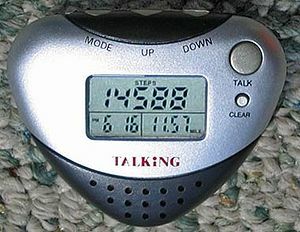 Pedometer total: 5,443 steps. Day 3: Thirty minutes on the bike, then doing some shopping, errands and work around the house. I had two appointments that required sitting for two-three hours, plus some time in the car. Did some up and down the stairs for laundry too. I thought with all the sitting I did that it wouldn’t be enough steps. But at the end of the day, Pedometer total: 6,506. Day 4:First thing in the morning I participated in a 5K (3.1 mile walk). At the end of the walk my pedometer showed 12,164 steps. It seems like my 5K walk should have recorded as 5,000 to 6,000 steps, which makes me think this pedometer is counting two steps for every one I take. Later, I did some more walking around town, shopping, and walked a little bit at a park. Pedometer total for the day: 18,349. After my four-day walking experiment, I’m starting to think that either: a) getting 10,000 steps a day is way easier than I thought it would be, or b) this pedometer is recording too many steps. Perhaps it’s recording any kind of side to side movement that I do as steps, or counting every step I take as two. It was not an expensive pedometer, so I guess I’ll never know unless I buy a more expensive one, or have someone else try this one and see what kind of numbers they get. But if my pedometer is correct, than it seems that even office-bound people should be able to walk at least 5,000 steps in the course of a day fairly easily. So, at this point my four-day unscientific experiment has shown inconclusive results. The accuracy of the pedometer remains unknown. It would be interesting to hear from others who have tried the 10,000 steps per day to see what kind of results you’ve gotten. Meanwhile, maybe I can get someone else around here to give my pedometer a try to get some comparison numbers. This entry was posted in Exercise and Fitness, Health and Wellness and tagged 000 steps, 10, exercise, fitness, health, heath and fitness, Pedometer, postaweek2011, walking by Huffygirl. Bookmark the permalink. Hmmm. I don’t have a pedometer, so I can’t help you out. But I am curious to know what other people have to say. I can say that before I started running, a brisk, 2-mile walk at least 5 times per week was enough to keep my weight under control and my mind calm (even though 2 miles didn’t seem very challenging). Walking is great exercise. Interesting Margaret. I know that between the steps I take each day, and my biking, I maintain my weight, but don’t lose any. I would have to add more exercise (and less eating) if I ever want to lose that pesky 5-10# that dogs me. Trouble is, I kind of feel like I don’t have time/energy to do any more. I wonder how many steps a day those who are losing weight are taking? I have been losing weight by cutting out grain/flour-based carbs, added sugar, and white potatoes. Truth be told, my body doesn’t feel great when I eat that stuff anyway, so it’s no great loss (except at dessert time – somehow cookies and cakes never make you feel bad 🙂 ). It’s a slow process but I’m getting off the winter weight. I’ve also found I can decrease my portion sizes without feeling hungry. We’re so programmed to believe that we need heaping plates of food. We don’t. Potatoes I could do – but I don’t eat them much so I’m not sure it would make a difference. I guess my problem is the desserts and after work snacks – I’m with you – they don’t make me feel bad and I don’t want to give them up. Not sure I can do enough biking to offset them though. Maybe I’ll have to try your suggestions. I wore the pedometer today and amassed 4406 steps by 9:24 PM. I am sitting for most of the day so I am surprised to have accumulated that many steps. Maybe it is double counting. I think it is double-counting too. But I don’t want to know badly enough to go out and buy a better one! Walking is the best exercise ever. I’ve, personally, never lost weight from walking, even when I was walking hundreds of miles to train for the 60 mile breast cancer walks. But it was great for toning and general well-being. The only way I can lose weight is to restrict white flour products, dairy, meat, and anything artificial (which means no snacks). The lbs do come off. Interesting. You are the second person to metion losing weight by restricting flour products (startches) and others. I too never lost any weight by just walking when I used to walk regularly for exercise. I also found when I switched from walking to biking that walking was not giving me enough cardiovascular fitness. It’s taken a while to improve there. I’m much better than I was, but still don’t achieve the cardio workout that I used to get from running. My next experiment may have to be cutting out refined foods to see if that takes off the pesky 5-10! Yet, I still tell my patients to walk for exercise if they are not already exercising (and most aren’t) because walking is better than no exercise at all. Let me know how this turns out. I’ve been thinking about getting a pedometer. I once counted my steps on a 20 – 30 minute walk (must’ve been really bored that day) and got up to at least 4000 but lost count near the end. I tried the pedometer again and am starting to think it is accurate. I started at zero, walked and counted 30 steps, it showed thirty steps. Tried it again and again and it seemed to work. Maybe I should give it to you to try awhile. One reason that it may have showed so many steps is that I rarely sit at home. I’m always up and down, doing laundry, running here and there. And I discovered that there are more steps in my house than I thought = just walking from the bedroom to the bathroom is about 15-20 steps.